Welcome back to Roadtrip-'62 ™ , as we make a two day stop in Cleveland, Ohio. Yesterday, we traveled 79 miles from Conneaut Lake, Pennsylvania, to Euclid, Ohio. We enter on US-6, of course, which is not a freeway today. In fact, it’s not a freeway all the way across Cleveland and suburbs. Though there are many other freeways in Cleveland today, back in 1962, there were almost none. They had plans for even more than were eventually built, a subject I’ll come back to tomorrow. For now, let’s see what historical sites the city offers. If you see anything you like, get yourself out on the road and enjoy it in person. I hope you’re having fun on this virtual roadtrip, I know I am, but there's nothing like the real thing! At any time, click on an underlined word below to learn more about the places on the trip. Time for me to grab the wheel and motor around the big city! We need to hunt for breakfast before going off to Cleveland. I intended to try the Village Inn we passed yesterday, back at US-6 and Bishop Road. However, when we passed I noticed it’s been converted to a Baker’s Square. I don’t know how long this location has been here, but the heritage is right for us, as the Village Inn chain was founded in 1958. Their first restaurant opened in Denver, Colorado and by 1961 they had their first franchisee. Even though the Baker’s Square name only dates from 1970, there’s still a bit of that earlier heritage, as the same restaurant company now owns both chains. In either case, you have your choice of lots of traditional breakfast offerings including buttermilk pancakes, crepes, french toast, omelettes, skillets with various tempting ingredients, and unlimited hot coffee refills. Both chains also have lots of great looking pies on the menu, for which they both use the trademark “The Best Pie In America.” Maybe I should have stopped here for dinner last night! US-6 comes down off the local bluestone escarpment onto the Lake Erie terrace at the point it meets US-20 in Euclid, Ohio. The bluestone is a type of durable bluish-gray sandstone which was quarried for many Cleveland area buildings, including the "old" Euclid City Hall. We could see the stone cut down by local streams, such as at the nearby Euclid Heritage Park, but we will see more dramatic examples of stream cuts and rock outcroppings later, on the west side of Cleveland. Just north of the point where US-6 meets US-20 is the Euclid Museum, operated by the Euclid Historical Society. The society was organized in 1959 and was originally housed in the city-owned Henn Mansion. That beautiful brick English Tudor-style mansion sits on the shores of Lake Erie and has been home to many city offices. It will make a great stop for a Roadtrip-’62 TM trip down US-20. We would have seen a rather small historical collection in 1962, but eventually, the building became too crowded for the artifacts, and since 1987 the museum has been here, in the former high school building. This building was used as an apartment building back around 1962. Let’s stop in and see the museum collection, which focuses on things used or made in the City of Euclid and Euclid Township. This includes an exhibit on local resident Charles Brush, the perfector if not inventor of the carbon arc lamp. The arc lamp was an early electric lighting system, created in 1876 before the more familiar Edison light bulb. By 1879, Cleveland became the first city to have its public square illuminated by the Brush lights. Soon, large cities in both the United States and Europe were lit by arc lamps. The museum has an actual arc lamp on display. On an interesting note, the common fluorescent bulb is technically a low-pressure mercury arc lamp. Almost across the street from the museum is Our Lady of Lourdes National Shrine. This Catholic shrine was opened in 1926 by the Good Shepherd Sisters. Operation was taken over by the Sisters of the Most Holy Trinity in 1952. The Shrine is a replica of the Grotto in Lourdes, France, and even incorporates two stones taken from the stone upon which Our Lady appeared in Lourdes. The water from the Grotto flows over these holy relics. It is open for pilgrims and parish groups to come for prayer and reflections. Over the years, visiting pilgrims have reported hundreds of favors, both spiritual and temporal, as granted. The Sisters of the Most Holy Trinity also have their Motherhouse on the property. Continuing into East Cleveland, Ohio, we drive past the entrance to Forest Hill Park. After 1873 this was the summer home of oilman John D. Rockefeller. Mr. Rockefeller made Cleveland the home of his giant Standard Oil Company for a couple of decades. At Forest Hill, he constructed carriage paths, ponds, bridges, and even a golf course on the property, which grew to 700 acres. In the late 1920s, his son, John D. Rockefeller, Jr., planned the Forest Hill residential development on part of his boyhood home’s land. He donated the parkland in 1938, so we could have enjoyed it in 1962. Parts of the Forest Hill community within adjacent Cleveland Heights, Ohio are now listed on the National Register of Historic Places, due to the large homes constructed in varied architectural styles in the early parts of the twentieth century by Cleveland's social elite. A list of historic landmarks is available and the Forest Hill Home Owners Association has information on the architectural styles in the area. We don’t have time to meander around much of the neighborhood, but if you like architecture, it’s a great place to drive through. I will drive through one street before I head back to US-6, as I just have to make a little detour deeper into Cleveland Heights. Even though I had a good breakfast, donuts always beckon and I can keep some for desserts later. Here, Lax & Mandel Bakery has been turning them out since 1956. Until 2005, they were only a couple of miles off US-6, on Taylor Road in Cleveland Heights. Thus, they would have fit within my 5-mile limit. But they recently moved to a location about 6 miles off US-6, and the old store is now for rent. I’m going anyway and I’m here for the donuts, and maybe even some bran muffins (another of my favorites). But if you’re looking for any type of kosher baked goods, this is the place. A few miles west on Superior Road takes me right back to the spot where US-6 and US-20 split. Today, US-6 travels to downtown Cleveland on Superior Avenue, while US-20 goes by Euclid Avenue. Back in 1962, both routes went down both streets, with the main numbered routes using Superior Avenue and US-6ALT and US-20ALT both using Euclid Avenue. We’ll head down Euclid Avenue a short way to Lakeview Cemetery for our next stop. 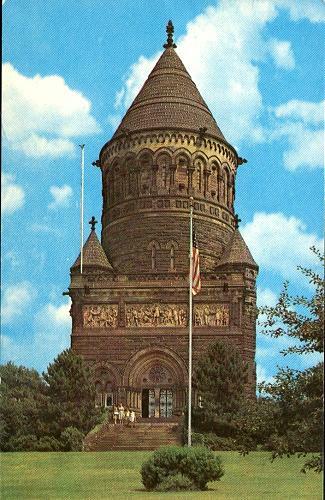 The cemetery is the location of the President Garfield Memorial, the final resting place of the 20th President of the United States. President Garfield was a teacher, a Major General in the Civil War, and a Congressman before becoming president. He served only briefly, shot only four months after being sworn in as president, and dying two months later. There is a lot of history to see here, but even if you’re not interested in President Garfield, the building is worth seeing. It was opened in 1890, combines Romanesque, Gothic and Byzantine styles of architecture, and includes stained glass windows. Mrs. Garfield is interred in the crypt with the president. Continuing southwest on Euclid Avenue, we arrive at Case Western Reserve University. The area just northwest of the university is home to most of Cleveland’s older museums. Known as University Circle, Forbes Magazine once named the area one of America's prettiest neighborhoods. Grand architecture is one reason, as the area is home to large churches, the buildings of the university, and museums…lots of museums. We have our choice of the Cleveland Museum of Art, the Cleveland Museum of Natural History, the Cleveland Botanical Garden, the Western Reserve Historical Society, and the more recent Children’s Museum of Cleveland and Museum of Contemporary Art. In 1962, we could also have stopped at the Health Museum of Cleveland, but it has since merged with the Museum of Natural History. That’s too much for us today, so we will not see the Children’s Museum, as that was only established in 1981. Likewise, the Museum of Contemporary Art was only established in 1968, so we can leave that off our itinerary. I think we can squeeze in any two of the remaining museums before they close this evening, so let’s try the Museum of Art and the Museum of Natural History. Whatever we can’t see today can be left for a Roadtrip-’62 ™ journey down either US-20 or US-322! The Cleveland Museum of Art has a large, diverse, and high quality collection well suited to a large, diverse, and moneyed city such as Cleveland. The museum opened in 1916, when manufacturing and shipping both provided funds for such an undertaking. They actually bought their first painting the year before: John Singleton Copley's Portrait of Catherine Greene. The museum has since continued to collect superior examples of American art, acquiring nearly 300 paintings and 90 sculptures from around 1750 to 1960. As an important force in the local art community, they also have approximately 100 works by Cleveland artists. Another very deep collection is European furniture, silver, and ceramics. It includes works from from the 16th to the 19th centuries. Something more unusual is their internationally renowned textile collection, containing about 4,500 textiles. These represent 62 countries and were made over four millennia, from 2000 BC to the present. And despite the existence of the Museum of Contemporary Art just down the street, the Cleveland Museum of Art also has a contemporary art collection. Because it includes only works of art created between 1961 and the present, we won’t be too interested. But it does have just a few pieces from 1962, like Andy Warhol’s ‘Marilyn x 100’. While we’re here, let’s have lunch at the museum’s Provenance Restaurant. It’s easier than ducking out to find something and then coming back to finish the tour. And a restaurant was probably here in 1962, as large museums usually feature one. Today it’s a 76-seat fine dining restaurant that features a locally-sourced menu that they claim, “...complements current museum exhibitions.” Not sure how you do that. Next up is the Cleveland Museum of Natural History. This museum seems nearly as old as Cleveland! It traces it’s roots back to the 1830s, when a group of 26 men with an interest in the natural sciences set up Cleveland’s first natural history collections in a small wooden building on Public Square, downtown. The building was so crowded with animal specimens that it earned the nickname “the Ark.” The Cleveland Museum of Natural History was formally incorporated in 1920. For many years it occupied the Hanna Mansion and later added an adjacent home on Euclid Avenue, then referred to as “Millionaire Row” (did I mention that manufacturing had made the city rich?) The museum’s first exhibition consisted of animal heads, hides, shells, stalactites, exotic birds and butterflies. The City of Cleveland leased property in Wade Park and to the Museum in 1953 and the present building was completed here in 1958. That means we would have seen new installations in a new building back in 1962. A dinosaur skeleton, Haplocanthosaurus delfsi, was among the first exhibits. Today, the museum includes permanent exhibits such as the Johnstown Mastodon, a prehistoric elephant that lived in the Cleveland area and became extinct more than 10,000 years ago at the end of the Ice Age. Next to it is one of its contemporary predators, a Saber-toothed Cat. Another permanent exhibit is the Foucault Pendulum, one of the first things you see when you walk in. The pendulum visually demonstrates the Earth’s rotation, because it appears to move slightly clockwise each time it swings. It actually comes full circle every 36 hours and museum staff place a ring of dominoes under the pendulum for it to knock over on its circular journey. At natural history museums, I always spend most of my time at the dioramas. They have some great ones here, where you can believe the animals can walk out at you or you can walk in. One permanent exhibit that was not here in 1962 is the skeleton of one of our 3 million-year-old human ancestors, “Lucy”. This Australopithecus afarensis was discovered in 1974. The Museum also features a planetarium, observatory, live animal shows and a woods garden highlighting native Ohio flora and fauna, including bobcats, river otters and birds of prey. It publishes Explorer Magazine (as it did in 1962) and the museum’s curators work in 11 natural science disciplines to further science. I suppose I should say a few words about the attractions we don’t have time to visit today, the Western Reserve Historical Society and Cleveland Botanical Garden. The Western Reserve Historical Society was established in 1867 as the historical branch of the Cleveland Library Association, which itself was founded in 1848. So it was definitely here for our 1962 trip. Until 1898, the Society was located in downtown Cleveland. It grew in both the size of its collections and importance, and was supported by leading Cleveland area citizens, including John D. Rockefeller. By 1898 the Society moved to the University Circle area, but not the present buildings. However, in 1938 the museum moved to its current location. Since then, there has been almost continuous construction and acquisition of structures, so that today it is a complex instead of a single building. The History Center, as they call the museum complex, now includes a library, history collection, Halle Costume Collection, and the Crawford Auto Aviation Collection. The Cleveland Botanical Garden began as the Garden Center of Cleveland, in 1930, and was the first civic garden center in the United States. The center began here in University Circle, in a brick boathouse along Wade Lagoon. In 1959, a flash flood in the area forced the Garden Center to consider a new location on higher ground. They settled on the current site, which had been the Cleveland Zoo until 1907. We would have seen the old site, however, as groundbreaking didn’t begin at the new site until 1964. In addition to the 10 acres of gardens, it has a large, modern greenhouse known as the Glasshouse. The Glasshouse is too also new for our tour, as it only opened in 2003. Tudor Arms DoubleTree Hotel, Cleveland, Ohio. It even looks impressive in my poor quality photo! Well, they almost had to kick me out at closing time, and everything else to see is closed now too. If not, I would have gone out to the Rockefeller Greenhouse, near Lake Erie. So let’s check in to our room for the night, at the nearby Tudor Arms DoubleTree Hotel. As I’m sure you’ve noticed, I usually do not stay at such large and expensive places. This one seemed warranted because it has been restored to its former glory. Inside, everything was redone, and the hotel's ballrooms and public spaces on the second floor have been restored to their original brilliance (there is retail space on the first floor). They have also been embellished with new murals. It all looks much better than it would have in 1962! The building was opened as the exclusive men’s club, the Cleveland Club, in 1933. The building was designed by architect Frank Meade, who also who built many extravagant homes in nearby Cleveland Heights and Shaker Heights. But the Cleveland Club could not maintain the building for very long due to the Great Depression and the thinning upper class of the city. It reopened as the Tudor Arms Hotel in 1939. Besides the hotel, it housed a supper club, with a wide variety of musical acts over the years. By 1960, as racial tension became a problem in the near east side, the days of the hotel were numbered. The two nearby universities, Western Reserve University and Case Institute of Technology, took over the property as a graduate student dormitory. They did some remodeling and slowly changed rooms into dormitories, while others continued to be used as a hotel. By 1963 the entire building had been converted into a dormitory. The schools eventually sold the building to the Cleveland Job Corps, which stayed until 2007. It was much neglected during its lifetime, as it was not a money-making operation for about 45 years. But the new owners had a vision and we can see it today! The Tudor Arms has benefited from a $22 million renovation, inside and out. This 11-story, 157-room hotel probably didn’t need a lot of exterior work, as it is constructed of brick and limestone. But the limestone ornamentation, including a sculpture of Moses Cleaveland in a niche overlooking Carnegie Avenue, was given a thorough cleaning. Even if you don’t stay, stop in and look over, and enjoy the public spaces. And, if you can’t get there, the DoubleTree website has some very good photos of what they have done to the building in a little slideshow. You know, maybe I will take that drive out to Rockefeller Greenhouse after all. It’s at the end of one of my favorite Cleveland drives, North Park Boulevard, and I can’t resist. The drive begins southeast of here and follows Doan Brook northerly from the Nature Center in Shaker Heights. Along the way are beautiful homes, an almost out-of-the-city drive, and the Cultural Gardens, with monuments to the various ethnic groups that make up Cleveland. Doan Brook and North Park Boulevard travel a valley to Lake Erie, formed as the lake’s water level dropped over the millennia since the last ice age. Much of the drop was due to the glacial lake flowing out over Niagara Falls, causing the streams around the Cleveland area to cut deep gorges. Even when closed, there’s something worthwhile to see at the Rockefeller Greenhouse. The gargoyles and other terracotta sculptures adorning the exterior were saved from the old Pennsylvania Railroad Euclid Street Station that was demolished in 1973. We could have seen them in place back in 1962. Near the greenhouse is the former site of the White Motor Company. For a period after World War I, the company was the number one maker of trucks and custom vehicles. During the next World War, they manufactured military vehicles, and in 1941 they produced the first Highway Post Office (HPO) for the US Post Office. The HPOs were a highly successful method of sorting mail while in transit, as had been previously done on rail cars. During the 1940s and 1950s, they were introduced to replace mail trains. Between 1960-1963 the highway mail service was replacing an average of 20 trains a month. I’ll let the Smithsonian Institute tell the rest of the story in their video. As for White Motor Company, they tried to stay big by purchasing small truck and farm-machinery companies such as the Oliver Corp. But the debt from the purchases did them in and in 1980, the company filed for bankruptcy. Meanwhile, that first Highway Post Office is now at the Smithsonian. After the HPO was decommissioned in the 1960s, a postal worker hid it in a various Post Office Department garages to keep it from being discarded as surplus. It was finally "discovered" and sold to the United Federation of Postal Clerks (which later became the American Postal Workers Union). They donated it and agreed to pay the cost of restoring the bus. That original HPO is now on loan to the Western Reserve Historical Society, right here in Cleveland! We come back to the University Circle area on the same North Park Boulevard, and now it’s time to look for dinner. Let’s make it easy and stop back to the Tudor Arms DoubleTree and try that. The Canopy Grille Restaurant, next to the lobby, offers Mediterranean and Middle Eastern cuisine. I’m sure the restaurant had a different name in 1962, though. After dinner, a drive around the University Circle area shows off more grand architecture in the many churches, including Temple-Tifereth Israel, Holy Rosary Church, Church of the Covenant, and the more humble Cleveland Friends Meeting (Quakers). On the university campus, there are other attractions to keep you busy, including the Cleveland Institute of Music, a conservatory founded in 1920. But I’m going to end the night at another music venue. The Cleveland Orchestra’s home, Severance Hall, is right here in University Circle and it opened in 1931. It’s been praised as one of America’s most beautiful and best-sounding concert halls, so it’s well worth a visit. Their concerts span a variety of music genres, with concerts for July 2013 covering Beethoven, Wagner’s opera Valkyrie, the music of Simon & Garfunkel, and a Salute to America on July 4th, with fireworks after the concert! I’ll be here for a couple of hours and I’ll see you tomorrow, when Roadtrip-’62 ™ heads into downtown Cleveland.